Conventional wisdom is like the monster under the bed for intelligence analysts. We’re all afraid of it but we can’t quite describe what it looks like. Some worry very much that they are actually guilty of it themselves. But we’d rather not talk about it. I struggled with the assignment because I felt that to talk about conventional wisdom I needed to use examples. Otherwise it wouldn’t be meaningful. But of course my example of conventional wisdom might be someone else’s strongly-held beliefs. I finally hit upon the idea of talking about conventional wisdom in the context of cosmology. If you study the history of man’s understanding of the universe and its origins, you become aware that it is actually the story of conventional wisdoms (plural intentional). The prevailing theory is replaced by a new theory that sooner or later becomes conventional wisdom ripe for replacement by the next new theory. Second verse same as the first. The lessons I draw could also be reversed and thought of as best practices for people who don’t want to be conventional thinkers. And so here they are. The 10 habits of non-conventional thinkers just in case you want to be one too. 1. Non-conventional thinkers are very suspicious of what anyone says they “know”. They consider knowledge a pretty slippery character who is largely the creation of whatever sensemaking tools are popular at the moment. When we develop new tools, we develop new knowledge that often topples down all previous architectures of knowledge. 2. Non-conventional thinkers eschew tidy, neat thinking. They like messy ideas. They go looking for them. They are not taken in by common human crutches such as the desire for symmetry. 4. Non-conventional thinkers don’t censor themselves. They try to say out loud or write down everything they’re thinking. I think too many people don’t even offer up the good ideas inside their heads. 5. They talk to and listen to very diverse people. They enjoy reading about ideas that are way out there. Last night on Netflix I watched a fascinating biography of William Burroughs. My Netflix Horoscope right now says I enjoy watching cerebral biographical documentaries. 6. They don’t think much is sacred. Not even Albert Einstein. Albert Einstein was a brilliant man. It seems like he was also a kind person. But he famously hated the idea of an expanding universe. Because astronomers and physicists were so in awe of him, they tried to explain away for about 20 years data that pointed to a big bang. 7. Non-conventional thinkers love to attack disciplines and ideas that have been static for a long time. They like even better to attack truths. 8. They love to look at things from completely different angles. They want to see the very finest details. They actually prefer to know exactly how things work. Non-conventional thinkers take no perspectives for granted and expect to find an element of truth even in the most outlandish points of view. 9. Non-conventional thinkers like to stimulate their thinking with sillinesses. They will engage in little rituals that fertilize their brains. 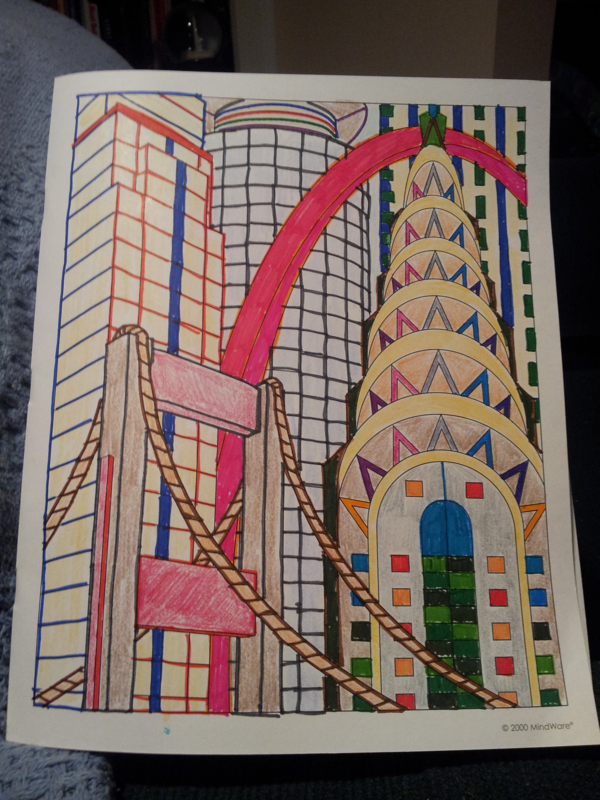 Today I colored. 10. Non-conventional thinkers never stop looking. This entry was posted in Future Thinking, Intelligence, linkedin, Rebels/Heretics, Thinking. Bookmark the permalink. I am not sure where it would fit, but I always want to know how “the conventional wisdom” became conventional. Where did it start? What drove people to accept it? How does it differ from the previous wisdom? Was it ever valid? Is it still valid? Are underlying conditions the same as when it evolved? Answereing these questions and others like them helps me determine if conventional wisdom represents crowd sourced analysis which may be more accurate than individual assesment or herd mentality leading lemmings over a cliff. I often find that convetional wisdom was actually fairly accurate when it first evolved but has failed to keep up with changes in the underlying environment. I noticed the change in style between your first three paragraphs and the rest. Your first three paragraphs address “wisdom” whereas everything that follows discusses “thinking”. It occurs to me someone can think forever and never achieve wisdom, because wisdom is “understanding”, not thought. The first half of Proverbs 2 defines it well. Well said! It was shockingly recent that I discovered information about workplace rebels, which led me to a level of self discovery that would make the Hare Krishna’s proud, and led me to your blog. We are indeed a misunderstood group. But perhaps if I start calling myself an unconventional thinker instead of a workplace rebel my boss will start talking to me again and quit hiding under her desk.